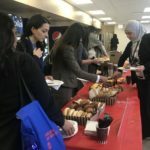 The Illinois AGD had the pleasure of welcoming the DMDAS Class of 2020 at breakfast on January 3, 2018. Dr. Muzammil Saeed, President of the ILAGD and Dr. Cheryl Mora, ILAGD Regional Director, and Past President introduced the students to AGD with a presentation entitled, “What can AGD do for me?” AGD Membership Coordinator, Aleida Lane and ILAGD student representatives Cassie Mora, DMD-2 and Malik Al-Grouz, DMDAS-3 attended the breakfast and spoke to the students about AGD and organized dentistry. 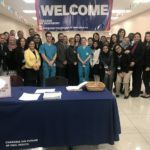 The ILAGD doctors, students and AGD staff discussed the importance of lifelong learning and organized dentistry and how the AGD will help the students become more successful in dental school and in their journey towards graduation and starting their dental careers.